Ineet and Ankit dated for more than 5 years.Both of them belong to the hospitality Sector and are filled with warmth. They have a taste for art and were the key elements for making the session possible. Here is the wedding story in the words of Ankit. They say Love is tested through years and years that go by and so was ours. We grew closer, and we grew apart, sometimes all at once. Our relationship was tested through good times, bad times, ok times… Sometimes through thousands of kilometres of distance between us. Safe to say though (at the cost of being corny) Love conquered all ! Luckily, with our parent’s approval and support, the decision to wed was nothing short of a cake-walk. The real challenge lay ahead though, if only you could imagine the complexity of a cross-cultural marriage. Well, we couldn’t!! The 1 year of preparation started to seem like a really long eternity. The This and the That, the cultures, the norms, the relatives, the meetings, the long, endless discussions.. OH, the discussions!! 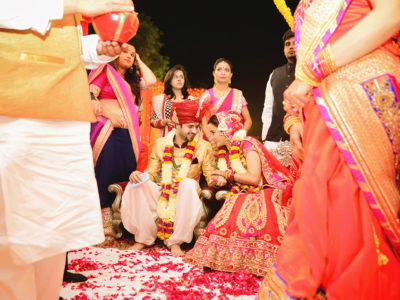 We all did eventually agree to have ‘Royal heritage of Rajasthan’ as the common theme of our wedding events. Our Sangeet ceremony at the old, time-tested ‘ITC Rajputana’ set just the right tone for the wedding. The choreographed dance performances by friends and cousins provided all the crazy fun and we couldn’t thank them all enough for being part of this important day with all their hearts.